IN May 1890 coal miners held their first meeting at the Bulli Oddfellows Hall to establish a hospital for the district. Later this month, 113 years later, hundreds of people are expected to gather at the same hall in an effort to prevent what they say is another step towards the hospital’s demise. The rally, at the Bulli Masonic Hall will be held at 2.30pm on Sunday July 29. The closure or downgrading of Bulli’s emergency department proposed by Illawarra Shoalhaven Local Health District (ISLHD) has caused an outcry in the northern Illawarra. The Save Bulli Hospital Emergency Department Group (Save Bulli ED Group), organisers of the rally, is expecting a large crowd. Over 10,000 people have signed a petition opposing a downgrade of services at the hospital. Save Bulli ED Group convenor Alison Fettell said the community have expressed their concern over the fate of elderly people and young families who rely on Bulli Hospital. “If you have a low income or you’re on the pension there is no way you can afford a $30 to $40 cab fare to Wollongong Hospital,” Ms Fettell said. The Bulli Hospital opened in 1892 and the community have fought many battles to prevent either its closure or downgrading. “They had the vision back then, and they left us a legacy of a hospital that has served us for over a hundred years,” Ms Fetell said. The NSW government is currently in the process of closing or downgrading dozens of hospitals across the state. Ms Fetell said NSW Health drive to centralise hospital services is forcing distressed residents to travel to busy, larger hospitals which are often overstretched and understaffed. Illawarra Health’s proposal for an alternative service – based on a model for an ‘urgent care centre’ – has also been rejected by the community. “I’m really angry that they want to downgrade or close Bulli Emergency Department and open something called an urgent care centre. 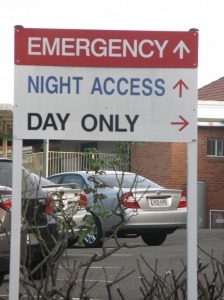 Save Bulli ED Group say the service model of alternatives to emergency departments in Victoria and the ACT charge exorbitant fees, have limited services and usually close at 8 or 10 pm at night. * Bulli Hospital Emergency Department should remain open as a Level 2 Emergency Department, 24 hours a day, 7 days a week. * Emergency services should remain in public hands and be free to the public. * A community board to manage the hospital should be reinstated. * The state government should stop closing and downgrading emergency services. The rally, opposite the Shell service station on the Princes Highway, will feature a sausage sizzle at 2pm prior to the meeting and live music provided by the Swingaleles.